'From the very opening passage there is a wonderful sense of spontaneity, a freshness and an obvious and very deep affection for every note of this wonderful score. Yet within this spontaneity they achieve a carefully conceived shape and structural unity. 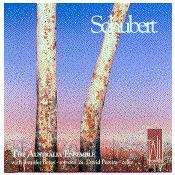 The Australia Ensemble is resident at the University of New South Wales, and since its formation some 12 years ago, has rapidly assumed eminence in Australian musical life. The permanent nucleus of the group comprises flute, clarinet, piano and string quartet, and it is these latter four players who are joined by the cellist David Pereira, in this performance of the Schubert String Quintet, D956. There is much to admire in playing of this stature, and the unfamiliarity of the performers should certainly not deter investigation of this disc on any account.There are obvious sympathies here with the Lindsay Quartet's version with Douglas Cummings on ASV in the natural pulse and projection of the first movement, with due deference being shown for the structural demands of the music (with the inclusion of the exposition repeat) but more notably in the compelling tonal homogeneity of the Australianplayers. It is unfortunate that the flowering second subject reveals a prime deficiency of the recording itself at such an early stage, however, for throughout one could wish for a more accurately focused lower register, with the second cellist's pizzicato accompaniment later barely registering at times; a trifling drawback, though, in a reading of unhurried eloquence. The entranced stasis achieved at the opening of the Adagio, however, is remarkably affecting, with the middle voices eschewing vibrato almost completely, and yet in total accord with the yearning violin discourse of Dene Olding, a superb player who is quite the equal of his Lindsay counterpart. But the outraged vehemence of the central episode loses much of its impact here, with the pained alarums of the second cello lacking in sheer presence and immediacy; a problem of the recording balance, rather than a reflection on David Pereira's playing.There are more exciting accounts of the scherzo, but the Australia Ensemble, in common with the Lindsays, recognize that discretion is the greater part of valour here, although the momentum and exuberance of the outer sections find an effective release in the hushed inner world of the trio. In a reading as cultivated and eminently well researched as this, the by now familiar attention to detail will come as no surprise, with rapt, expectant playing from the Australia Ensemble here. They find appropriate muscular energy in the finale, too, but the Lindsays and the Alban Berg players on EMI enter more deeply into the emotional undercurrents of the music. By any standards, this is a fine disc which, although never challenging the Berg/Schiff performance, offers many rewards, not least among which is the charismatic singing of Jennifer Bates in the unusual choice of filler, Der Hirt auf dem Felsen, D965.